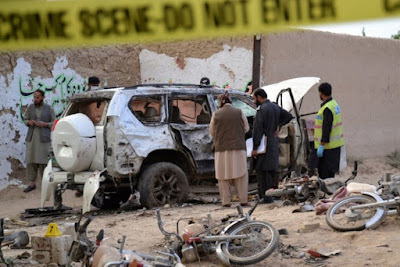 A bomb exploded next to a convoy of the deputy chairman of the Pakistan Senate on Friday in the violence-plagued province of Baluchistan, killing at least 25 people, officials said. Islamic State claimed responsibility for the bombing. The group's Amaq news agency said a bomber wearing an explosive vest carried out the attack, which was condemned by a former local Islamic State affiliate. At least 35 people were wounded in the blast near the town of Mastung, 50 km (30 miles) from the provincial capital of Quetta. Television footage showed a vehicle mangled by the blast. Senator Abdul Ghafoor Haideri, the deputy chairman of the upper house of parliament, told Reuters minutes after the explosion he believed he was the target and he had sustained minor injuries. "There are many casualties as there were many people in the convoy," he said by telephone. Haideri is a member of Jamiat e Ulema Islam, a right-wing Sunni Islamist political party that is part of Prime Minister Nawaz Sharif's coalition government. District health official Sher Ahmed Satakzai said the death toll had risen to 25 and 10 were in critical condition in hospital. Security in Pakistan has improved since a crackdown on militancy began in 2014, but a fresh wave of attacks that left more than 100 people dead in February has increased pressure on Sharif's government. Mastung police official Ghazanfar Ali Shah said the convoy appeared to have been hit by a suicide bomber, adding Haideri's driver was among those killed. The senator, who is being treated in hospital, was on his way back to Quetta after distributing graduation certificates to students from a madrassa, or religious academy. Militant group Lashkar-e-Jangvi Al Alami, which has jointly carried out attacks with Islamic State in the past, including a bombing at a shrine in Baluchistan in November, condemned Friday's suicide attack, spokesman Ali Bin Sufyan told Reuters. Sufyan said the two groups have now split due to "policy changes", but did not elaborate on what changes had taken place. Separatist militants in Baluchistan have waged a campaign against the central government for decades, demanding a greater share of the gas-rich province's resources. Taliban and other Islamist militants also operate in the province, which shares borders with Afghanistan and Iran. A U.S. drone strike killed Taliban leader Mullah Akhtar Mansour last year in Baluchistan. The province was rocked by a series of attacks late last year that claimed over 180 lives and raised concerns about a growing militant presence. A judicial report released after an attack on the province's lawyers left more than 70 dead criticized security provisions in the region and called for increased clampdowns on extremists.